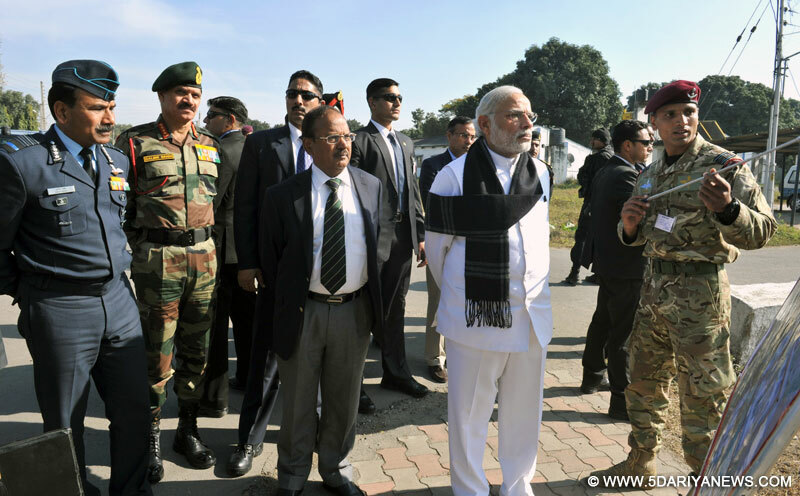 The Prime Minister, Shri Narendra Modi being given a presentation on counter-terrorist and combing operation by the Defence Forces, at Pathankot Airbase on January 09, 2016. The Chief of Army Staff, General Dalbir Singh is also seen. Prime Minister Narendra Modi was on Saturday briefed by senior defence and security officers about the terrorist attack, carried out by suspected Pakistani terrorists last week, on the Pathankot IAF base.The prime minister arrived here on Saturday morning for an assessment of the attack.Soon after landing at the air base, targetted exactly a week ago in a pre-dawn attack, Modi met senior Indian Air Force (IAF) and army officers.Tight security arrangements were in place for the prime minister's visit. No one was allowed to enter the area near the Air Force Station (AFS), located 250 km from Chandigarh.The prime minister was taken around the air base by the defence and security officers. Modi is likely to fly to the border belt with Pakistan in Punjab in an IAF helicopter for a first-hand account of the security measures at the border.The terrorists are believed to have infiltrated into India from Pakistan side by taking advantage of broken border fencing.Six terrorists and seven security personnel were killed in the attack.Security forces repulsed the attack and the terrorists were unable to harm any of the IAF's critical assets, including fighter aircraft and attack helicopters.